This past summer Bill Murphy of Fresh Monkey Fiction launched a Kickstarter to bring his Amazing Heroes action figure line to plastic life. 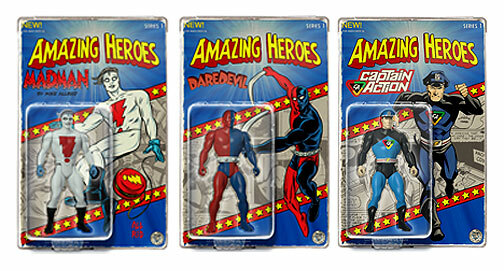 Amazing Heroes is focused on the somewhat forgotten heroes of the Golden Age of Comics such as the original Dare-devil, Stardust the Super Wizard, the Black Terror and others, including Captain Action. The campaign successfully funded in August, but wasn’t able to to reach the stretch goals of Champion of Mars and Silver Streak. Not content to let those characters fall by the wayside, Bill is back with the Wave 1.5 Kickstarter to add both Champion of Mars and Silver Streak to the initial production run of the line. And, for good measure Mike Allred’s Madman was also added. Initially as a stretch goal if the campaign hit $22,000 but was later unlocked early and is now available to pledge for. As I’m typing this, the campaign has broken $12,000 and is headed towards it’s $15K goal in a little less than 5 short days (ends on December 21. 2014). We spoke with Bill during the initial Kickstarter campaign, and wanted to check back while Wave 1.5 is still running to see how things are going with Amazing Heroes! AFi: Bill, the initial Amazing Heroes Kickstarter funded back in August. Tell us a bit about what that was like for you, to see your brainchild reach it’s goal and begin it’ journey to plastic reality. Bill: It’s been great so far, but I still have a long road ahead. This stuff does not happen overnight for sure. It’s a lot of long hours, but it’s spending time working on something you love, so that’s the most gratifying aspect. I’m glad we took the opportunity when we did to expand the line. AFi: And, now you’re back with Wave 1.5. What brought you back to the well, so to speak? Bill: Really it was the fans. I kept getting email and Facebook posts asking when/if we were going to make Silver Streak and Champion of Mars. I figured well why not try to raise the funds just like we did the 1st round. AFi: As of this writing, you recently broke $10,0000. That’s a significant milestone in the campaign. How are you feeling about the campaign’s progress thus far? Bill: Really good. We have a week left go to. I think the biggest challenge will be to get more internet coverage over the next week. We need to reach comic book fans, not just toy fans. The more comic books sites that pick up the story, the better chance we’ll have of getting the Kickstarter funded. AFi: I was excited to see the new Kickstarter happen, with the opportunity for Champion of Mars and Silver Streak to be added to the line. But, personally, seeing Madman added to the line put me over the top. How did making Madman as a figure come about? Bill: It’s all Chris Irving. Chris has been doing a tremendous job not only heading up the social media and writing copy for the campaign, but he’s the BIGGEST fan of the line. He and I share a love for comics. Chris happened to be working with Mike Allred on a book, so he was kind enough to make the introduction. Turns out Mike is HUGE fan of this style of figure, so he was happy to hop on board. I still can’t believe that I’m working with him to create a Madman figure, it’s a dream come true. AFi: If Wave 1.5 funds is the plan to release these 3 new characters at the same time as the initial lineup? Bill: That’s the plan, they’ll all be produced at the factory at the same time. AFi: That creates a pretty significant collection right off the bat. That must be pretty exciting! Bill: Yeah, we’ll have 10 figures in the line up when the Wave 1.5 Kickstarter funds. I just hope we can fund these new Artist Edition card backs, that’ll really make the collection POP!!! We’ve got some really amazing artists lined up such as Mike Allred, Erik Larsen, Reilly Brown, Tim Seeley, Sonny Liew, Phil Hester, and Tom Fowler. 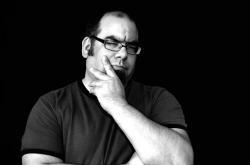 AFi: Where are things at, pre-production wise? Bill: We’re in the prototype phase at the moment. We were not happy with the initial prototypes the factory produced so we’re re-doing them and adding some additional parts. We hope to move into production in early Feb.
AFi: Will the figures have peg-holes on the bottom of their feet? Bill: That’s the plan, but we need to figure out the best size. Any suggestions? AFi: We’ll put that one out to our readers. Folks, what size of peg hole do you think would work best? Share your toughts in the Comment section below! AFi: What has been some of the challenges you’ve faced with this Kickstarter? Has it been different with this second one? I think the biggest challenge is always coverage and exposure. There are a lot of Kickstarters these days, AFi has been great for us as far as exposure, but to be honest I think the majority of websites out there are tired of covering Kickstarter projects. The market is flooded with new Kickstarters every week, so I don’t think the news sites think it’s very “fresh” anymore. This sort of makes me sad cause I really believe in the Kickstater platform. We’ve seen some really great indy toy projects come out of Kickstarter the last year or so and I want to see it continue. The new Kickstarter has given us a tad more exposure cause we have some really high profile comic creators on board, so that’s different then the first one. AFi: Assuming Wave 1.5 funds, where do you go from here? When would we potentially see a full Wave 2? We’ll continue to move into production for the line. That’s the focus moving forward. I want to get these figures into the hands of collectors. The earliest we’d consider a Wave 2 would be late 2015. AFi: What’s one thing you’d like to communicate to AFi readers about Amazing Heroes? Well first I want to thank all the supporters of the line, we wouldn’t be at this point without them. As we move into the last week of the Kickstarter, I would ask folks to help spread the word about the latest Kickstarter. I know folks really want to see Madman, Silver Streak and Champion of Mars produced, plus we have some really great comic book artists lined up to do some original packaging art, something that not a lot of toys are doing these days. AFi: Bill, as always, thank you so much for your time and best of luck with Amazing Heroes! So, folks, this is crunch time to get these Amazing Heroes made. Remember, Kickstarter doesn’t charge you until the campaign ends, and only if it funds. So, pledging now costs you nothing until December 21st! The figures are expected to ship August 2015.